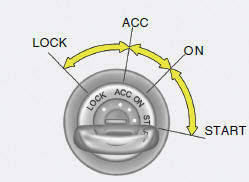 The engine should not be turned off or the key removed from the ignition key cylinder while the vehicle is in motion. The steering wheel is locked by removing the key. The key can be removed or inserted in this position. To protect against theft, the steering wheel locks by removing the key.